Since humans first wandered from their original habitat in Africa, over fifty millennia ago, they have radically altered the environment wherever they have gone, often at the cost of the animals who'd ruled the wild before mankind's arrival. Humanity's spread throughout the globe has begotten what paleontologist Richard Leakey has termed the "sixth age of extinction" -- the most deadly epoch the planet's fauna have seen since the demise of the dinosaurs. And in the last five hundred years, since the dawn of the age of exploration, this rate of extinction has accelerated ever more rapidly. 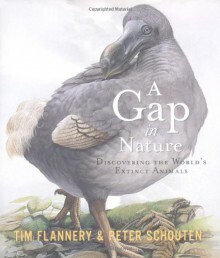 In A Gap in Nature, scientist and historian Tim Flannery, in collaboration with internationally acclaimed wildlife artist Peter Schouten, catalogs 104 creatures that have vanished from the face of the earth since 1492. From the tiny Carolina parakeet to the majestic Steller's sea cow, which was over twenty-five feet long and weighed ten tons, all of these animals have become extinct as a direct result of the European expansion into every corner of the globe. Flannery evocatively tells the story of each animal: how it lived and how it succumbed to its terrible destiny. Accompanying each account is a beautiful color representation (life-size in the original painting) by Schouten, who has devoted years of his life to this extraordinary project. Animals from every continent are represented -- American passenger pigeons, Tasmanian wolves, and African blaauwboks -- in this homage to a lost Eden. This extraordinary book is at once a lament for the lost animals of the world and an ark to house them forever in human memory.